Bobby Davro is a Comedian, Actor, Impressionist and Singer. 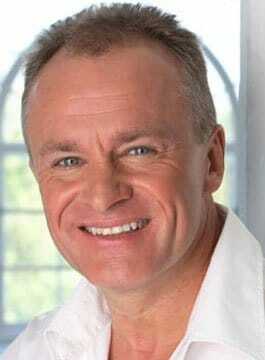 Davro is recognised as one of the UK’s most versatile and experienced celebrity comedians. Bobby made an early impression at school, when he was caught mimicking his headmaster, a Harold Wilson sound-a-like, and was given six of the best! After leaving school, Bobby worked as a trainee manager in a large department store, where he was soon trying out more impressions as John Inman and Mrs. Slocombe. His next job was in his father’s retail store – named ‘Davro’ after sons David and Robert (Bobby). He later left the shop to pursue a full-time career in showbusiness. Bobby Davro made his TV debut in 1981, but his major breakthrough came with an appearance on Live at Her Majesty’s in 1983. This led to his own prime-time Saturday night television shows ‘Bobby Davro on The Box‘, ‘Bobby’s Sketch Pad‘ and ‘TV Weekly‘, which immediately topped the ratings for six consecutive years and made Bobby a household name throughout the country. In 1991 Bobby moved to the BBC and made three series, ‘Public Enemy Number One‘, ‘Rock with Laughter‘ and ‘Run the Risk‘. He returned to our screens in May 1997 as host of Yorkshire Television’s ‘Winner Takes All‘ for 65 programmes. In his rare moments away from the world of show business, Bobby likes nothing better than a game of golf, a game of snooker, a spot of fishing, or a glass of Chardonnay in front of the telly. Away from comedy, Bobby regularly treads the boards as an actor. In 2008, he appeared on our screens as Vince ‘Vinnie’ Monks in Eastenders. Bobby Davro is an ideal choice when you require a superb multi-talented, comedy cabaret performer for your event.